This county competition is for students in grades three through twelve. 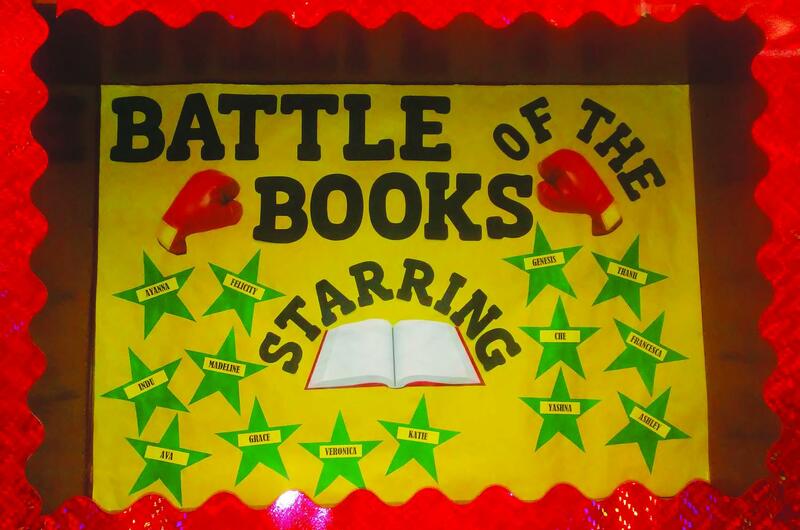 It is that time of the year readers, the Battle of the Books is back in action. According to media specialist Amy Armbruster, “As far as I know, for the past three years I’ve been here we haven’t had a team participate in The Battle of the Books.” This year, Mrs. Armbruster is sure to have a team represent the school. This program is for students who read for pleasure and love to “battle” against other students. Meetings are held on Fridays during lunch in the media center. During the meeting, teams discuss the books they have read and are given practice problems to prepare for the online qualification test in January. The team sponsor is media specialist Amy Armbruster, and she will chaperone during the online qualification test. The online qualification test is consisted of two hundred fifty questions with only twenty minutes to answer each question. The goal is to answer as many correct responses as possible. This test is to see which teams will move on to The Grand Battle which takes place in February. Whoever wins first place according to their grade level will get a trophy for their school and certificates for the team. Some strategies that Armbruster suggested was to treat the books like “babies” and read the books that interest the reader the most. For example, Armbruster suggested, “if you like fantasy, then adopt the fantasy baby.” It is recommended that team members each read a fair amount of books from the list and have a discussion about each one. There are a total of fifteen books that are all of diverse genres like science fiction, realistic fiction and romance. One reason why Armbruster enjoys having the meetings is because it can allow the students to possibly cross a boundary with genres, and go past their comfort zone. The books are all age and level of comprehension appropriate. A new list of books are chosen every year for the Sunshine State Books and the Florida Teen Books. Elementary and middle school students read the selected Sunshine State Books for that year and high school students read the Florida teen books. The Battle of the Books is open to all students in grades three through twelve to read books and compete with other students.